Who are we? Artists in the Clay Guild of the Cascades (CGC) share a passion about clay with each other and the community. 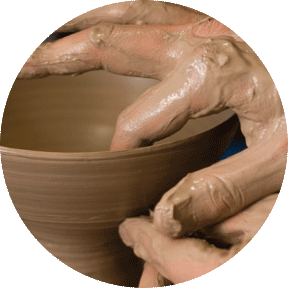 Our aim is to promote creative self-expression in clay, share knowledge and experience, and facilitate an appreciation of handmade pottery and ceramics. Activities that support our aim are member meetings, educational workshops, cooperative purchases of supplies, exhibitions, and participation in charitable projects to such as Empty Bowls. The Clay Guild of the Cascades meets occasionally during the year (dates will be posted at the top of this page when the schedule is set. If you know anyone who might be interested in joining our guild and hasn’t yet because of lack of information, shyness, whatever, have them come to our next meeting. Events and Studio Tours are scheduled on the alternate months of the Guild meetings when available. (February, April, June, August, October, December). If you are interested in staying in touch with the Clay Guild and participating in or supporting its activities, please consider becoming a member or renewing your membership. It only costs $20 and comes with benefits! Learn more about membership and its benefits. To join now or renew your membership, download the Membership Application.